I came across a recipe for apple slaw. I thought that sounded interesting. Nice and refreshing. 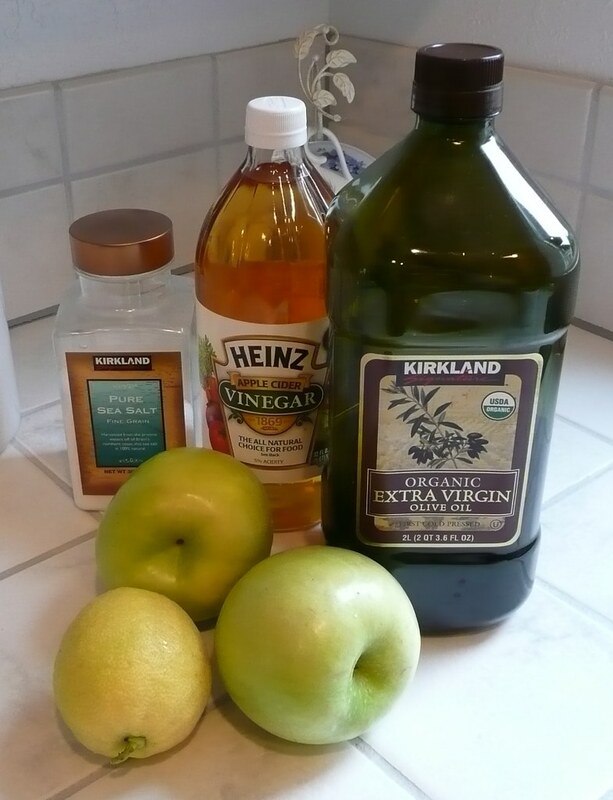 But I did my usual skimming of the recipe and I thought there was apple cider vinegar in it. I bought the apples and didn’t buy any apple cider vinegar because I thought I had some. I didn’t have any. I went to the store a couple of times but didn’t have apple cider vinegar on my list so of course, I didn’t get any. I finally remember to get some. I planned on making it on a night that I was subbing an evening class after teaching Nia in the morning. The class I had to sub was early so I had planned on making the slaw before class. This was my plan when I bought the vinegar. Between purchase and the actual day, I forgot that I was going to make this. So my day is going on and I begin to prepare dinner to start cooking while I am gone, then I remember I wanted to make this slaw. And even though it is slaw, I was thinking the apples were to be sliced really thin. Like mandolin-sliced. I don’t have a mandolin, but I figure I can slice them thin. So I run up to my computer to get the recipe and, “Oh yeah. SLAW – grated. Well, I am going to slice them AND leave the skin on.” That was my thought process. Also included in that thinking was, “No apple cider vinegar? I must have not copy and pasted properly. I could have sworn it had apple cider vinegar.” I also usually copy and paste the website where I got the recipe into my document. Since I didn’t see that I KNEW that I copied the recipe wrong. But I couldn’t remember where I got the recipe. So I had to look around and think. Then I remembered. I went to the site . . . nope, I didn’t copy it wrong. I still don’t know where I got the idea that the recipe called for apple cider vinegar. But I decided since I bought the stuff I was going to use it. So MY recipe for apple slaw turned into more of an apple salad. And I loved it. Hope you like it too. Peel* the Granny Smith apples and then slice them very thin. Mix the juice from 1/2 of the lemon, the oil, and the vinegar in a bowl. Toss with the apple slices. Add the salt. Just a couple of sprinkles. 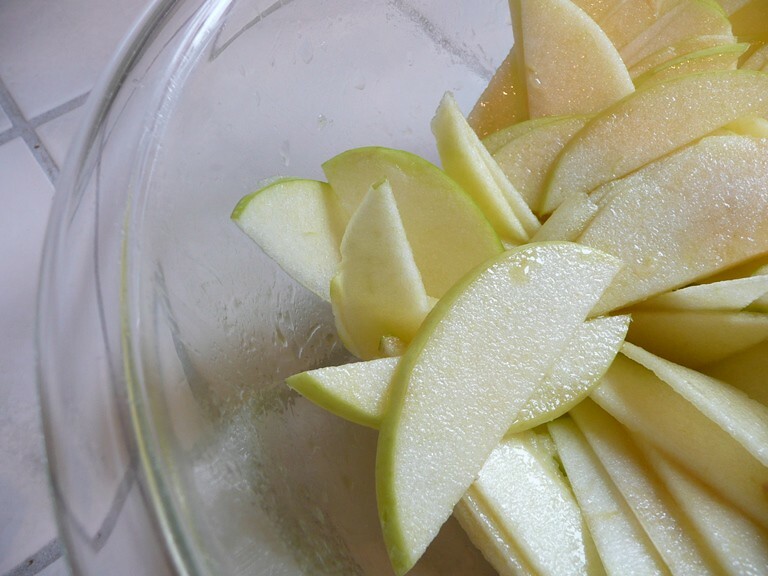 Then squeeze a little more lemon juice on top of the apples (from the other half of the lemon). Cover and place in the refrigerator for a few hours. If you are able, you can toss the mixture during the cooling period so that all the apples have a chance to sit in the juice mixture. 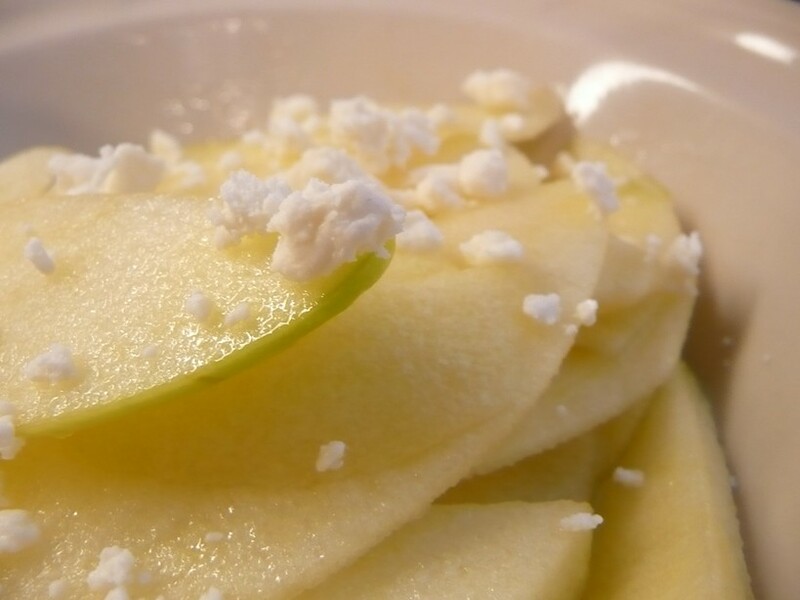 Once you are ready to serve, move the apples into your individual dish and sprinkle with a little feta and serve. You might feel it needs a little more salt, but that is up to you, the feta sometimes adds just the right amount of saltiness. The apples I used were HUGE so it will be about 4 to 6 servings. *You might have noticed that in my introduction I said I wanted to leave the skin on the apples. And I did on parts of it, but those parts were so difficult to slice thin. Granny Smith has some thick skin I’d say and I was in way too much of a hurry to try to force it. So I peeled the other apple entirely. Much, much easier to slice. This would also be fine without the feta. Or maybe even good with a nice shredded cheddar? Either way, I really like it. It is easy and refreshing. A nice summer salad. One of these days I will actually try making the SLAW! What do you think? Have you had apple slaw before? How about this, anyone up for apple salad? This entry was posted on June 11, 2015 at 4:35 pm	and is filed under "Recipes", Food. Tagged: apple cider vinegar, apple salad, apple slaw, Granny Smith apples, My Meals Are On Wheels, Nia class. You can follow any responses to this entry through the RSS 2.0 feed. You can leave a response, or trackback from your own site. I loved this one honey. It was very very nice :). Looks Yummy! And so simple, also I am looking for reasons to use Apple Cider Vinegar, besides drinking it – such great health benefits! It is sooo simple and yummy. Sometimes simple is so awesome!!! !